eziFunerals is a new online funeral platform that empowers consumers Australia wide, but this free and innovative funeral service isn’t well understood by many grieving families. Many don’t know how they can save thousands of dollars on funeral costs and take control of their funeral rights. With that in mind, here are ten frequently asked questions about eziFunerals and the answers to each. eziFunerals is an online consumer advocacy and planning service for consumers who require specific support and assistance in organising a funeral and selecting a funeral director. If you are uncomfortable with searching for a funeral director, don’t know who to trust, want to save money or simply wish to avoid a sales focussed environment, then eziFunerals would be suitable for you. 2. How does eziFunerals work? You first need to register as a client on our website. Once you have created your Account, simply follow the steps and provide us with the information needed to prepare your personalised funeral plan. On completion of your plan you will then be able to invite multiple funeral directors to provide you no obligation funeral quotes. Funeral directors, then place competing bids to win your business. This means you get bids in a fraction of the time you spend getting quotes over the phone or by visiting hundreds of websites. 3. How much does it cost to use eziFunerals service? IT’S FREE! Simply create an account with eziFunerals and plan a funeral from the comfort of your own home. Once your plan is complete, use our platform to get comprehensive quotes on your personalised plan from independent funeral homes. This offers you the best possible outcome of selecting the right funeral director at the right price. Customise a funeral plan, have funeral homes compete and in just 24 hours you can save hundreds or even thousands of dollars. 4. Why should I plan a funeral through eziFunerals? Planning a funeral through eziFunerals could save you thousands of dollars as well as reducing the stress your family and friends face at a time of intense grief. Our online funeral planning tool will allow you to discuss and plan the funeral arrangements with your family in private and avoid a sales focused environment before signing a contract a funeral director. 5. Should I shop around for Funeral Services? Yes. Funeral costs charged by funeral homes can vary significantly. Most publicly listed funeral brands don’t provide an itemised quote for the cost of a funeral. So it pays to do your homework. Although, it may be emotionally difficult for you to shop around for funeral services, it makes sense that you should use the same techniques you use with any other major purchase. 6. How do I create a Funeral Plan? Simply register as a client and follow the steps provided to plan the funeral. Each section has help text to guide you through the funeral planning process. To show the hidden help text, click the ? buttons at each question. The convenience of online technology means you can prepare your funeral plan anywhere any time you want. You’re able to stop and resume the funeral planning form at your leisure. Once a funeral plan is created through eziFunerals you can be rest assured that you and your family will be empowered to make informed decisions about all your funeral-related matters. For more information about planning a funeral for yourself or a loved one, please contact us. 7. What information is contained in a Funeral Plan? 1. “Details of Person Making Arrangements” allows you to record details you or your family will need for official records. 2. “Details of Deceased” allows you to record details of the person who has passed away or a death is impending. 3. “Details of Committal” allows you to record how you would like you or your loved one to be put to rest. 4. “Details of the Funeral” allows you to record your wishes regarding your or your loved one’s funeral. Once a funeral plan is created you can store it online, download it, and use it to compare funeral prices from multiple funeral homes in your area before selecting a funeral director that’s right for you. 8. How much money can I save through eziFunerals? 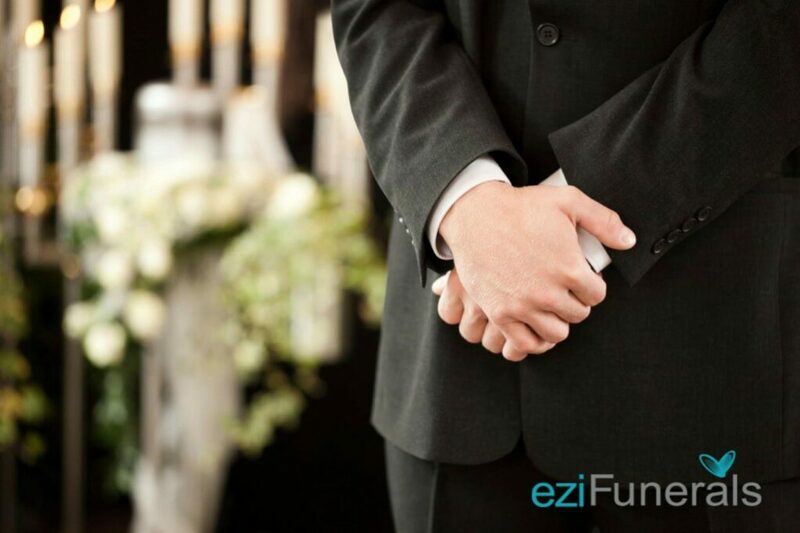 eziFunerals makes no guarantee regarding the amount of money the average family will save. However, we do guarantee that we can show you how you could potentially save thousands of dollars and stay within your budget by comparing prices charged by funeral directors. 9. Is eziFunerals the right option for me? eziFunerals is an independent funeral consumer advocacy and planning service for families who need help when someone has passed away or the loss of a family member is anticipated soon. Unlike other funeral companies, we offer a service where you can instantly plan your own funeral, search for funeral directors in your area, compare them side by side, read reviews, get help to pay the funeral costs and even start your own funeral crowdfunding page. 10. Does eziFunerals receive commissions from Funeral Directors? No. eziFunerals is an independent and Australian owned company. We are not part of any other funeral company. We do not conduct funerals, nor do we receive commissions from Clients final decision-making. Our sole purpose is to provide the information clients need to make a well-informed decision and get value for money.